Finally – a list of all my boats on one page! I’ve meant to get this project done for entirely too long, and now here it is. Enjoy! This page is in reverse order; the most recent boat is listed at the top. To view in sequence, begin at the bottom of the page. FishWisher IV was a head turner and a very comfortable and efficient fishing machine. I purchased this beautiful 2009 C-Dory Angler 22′ in November of 2010 – and spent a small fortune setting her up as I wanted. This photo shows her as she was after all the work. The posts detailing the many improvement projects are here; begin from the bottom of that page, too, to see her from the beginning as those posts are also in reverse order. I purchased this very comfortable boat because I really missed being able to spend nights on the water – the North River just wasn’t built for such use and I wanted a bed to sleep in! This C-Dory had a comfy V-berth and I spent a lot of nights aboard her on the delta. I enjoyed this boat immensely for three years as she was very comfortable after all the upgrades. After sitting for three months during the summer of 2013, I realized the time had come to give up boating and fishing. I had to admit it just wasn’t much fun anymore because I just was too old to enjoy the work involved. When I sold her, a fellow from San Diego bought her for ocean fishing and I heard that she did very well fishing tuna off the coast. FishWisher III was an impulse buy and the only brand new fishing boat I ever owned. It was back in 2008, during the late fall or winter if I recall correctly, that I visited the North River dealership in Sacramento with my fishing buddy, John. This beauty was on the showroom floor and I climbed aboard to look her over just for fun. The awesome construction and finish really impressed me. I was frustrated with the limitations of the little Klamath, and decided to buy the new North River! This and the next photo are photos taken the day I brought the North River home. What a gorgeous and well built tank of a boat she was! I spent many happy hours fishing aboard the beautiful North River. She was a very seaworthy vessel that easily handled anything Suisun Bay could offer. The North River came with a full canvas that made cold weather fishing tolerable. I installed all the usual electronics on the North River, of course. She had AM/FM/CD, VHF, and even XM radios, a Humminbird fishfinder/GPS/Chart plotter, windlass, electric downriggers, etc. I installed an electric windlass with a 100′ chain rode. I had been spoiled by the windlasses on Midlife Cruises II and FishWisher I and had grown too old to be wrestling an anchor by hand! 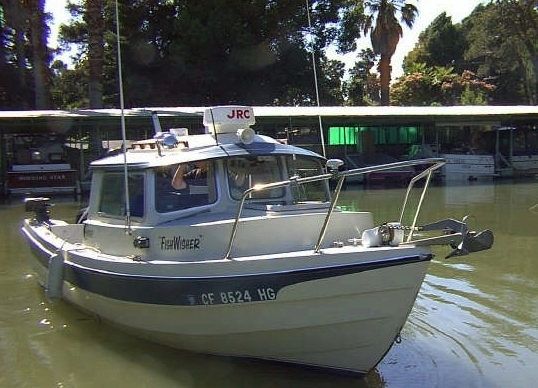 FishWisher II, a 2005 Klamath ADW 15′ aluminum boat. Having foolishly sold the C-Dory in December of 2007, by early 2008 I had recognized my mistake and was looking for another boat. I bought this cute little 15′ Klamath in February of 2008. Yes, it was quite a step down from the C-Dory that was so well equipped and seaworthy, but it was an Ok lake boat. I used her in a limited way on the delta, and caught my share of sturgeon with her, but she was too small to take downriver to my favorite fishing area, Suisun Bay. 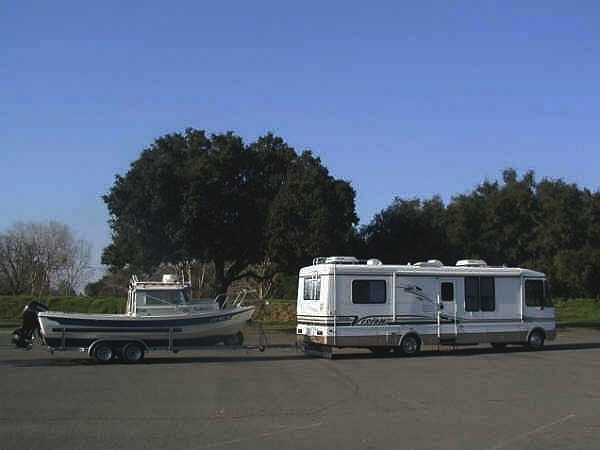 I sold her in December of 2008 after buying the much more seaworthy North River; I wanted to fish Suisun Bay! Here’s the completed helm. Note AM/FM/tape radio, VHS, cell phone cradle, XM to far right. For a 15′ boat it was loaded! 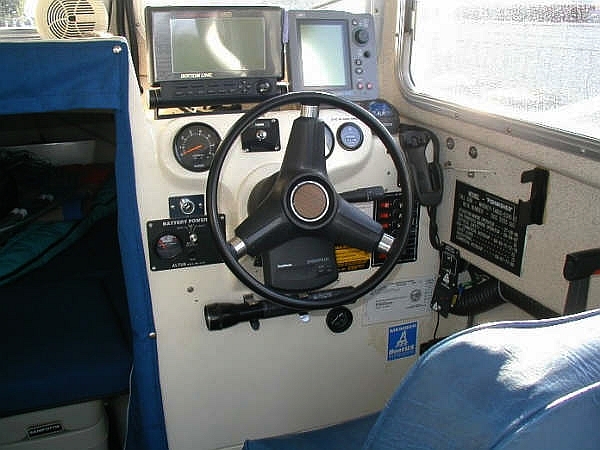 The cockpit when I got the boat. It was bare bones. Here I install electric downriggers in place of the manuals that came with it. My friend John as we trolled Camanche lake. Note the manual downriggers which I replaced with electrics. During the time I had the very comfy Bayliner, I began looking into lake fishing. We have many lakes in Northern Kalifornistan, and the idea of fishing for kokanee and trout was very enticing. I began looking for a towable boat. FishWisher I was a very cozy retreat on the water, a great Delta fishing machine and, now years later and no longer fishing or boating, I can honestly say she was my best boat ever! 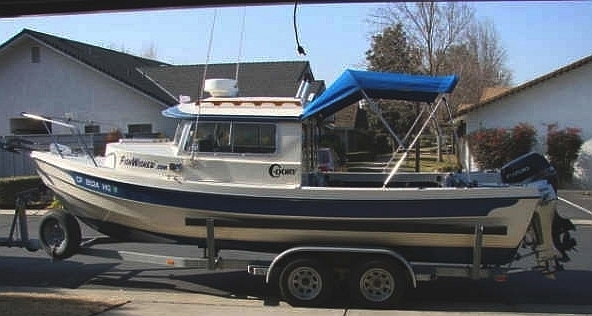 My first (of two) C-Dory’s, a 1987 Angler 22 was, by far, the best boat I ever had. I thought, at age 63, that I was getting too old for the efforts required for maintaining a boat and overnight fishing. Some time after I stupidly sold the boat I realized I missed boating and fishing. I bought, modified, and used on an almost weekly basis, three more boats over the next six years. Selling her was one of the stupidest things I have ever done – and I have a long list of stupid things I’ve done! When I bought her, she was to be my “lake” boat, and I fished the Delta with the big Bayliner. But I soon realized the C-Dory was plenty of boat for both Delta and lake fishing and boating. Not long after that realization, I sold Midlife Cruised II and was happy to be back down to just one boat! This is a sad announcement, but due to my aching bones and advancing age… FishWisher the boat has been SOLD! 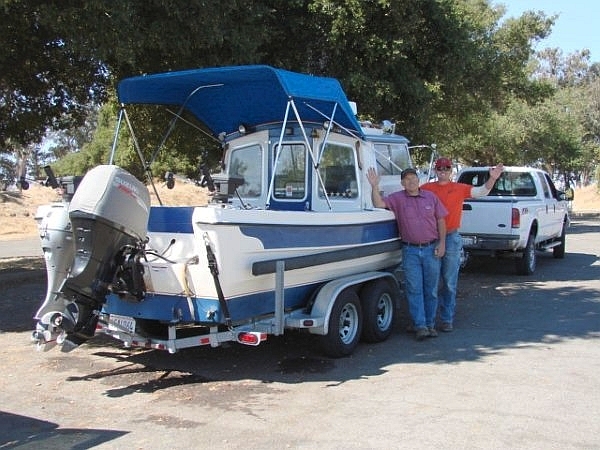 The new owners of FishWisher, father and son Mark and Austin Edwards – who are as likable and active in the outdoors as a family can be – wave as they prepare to tow their new boat home. It is a bittersweet time for FishWisher the guy, but times change as we get older and I know this is what is best for me at this time. I miss my baby, there’s no doubt of that. But I don’t regret selling her as it was the right thing to do at this time of my life. I’ll always remember the great adventures I experienced aboard my beloved FishWisher I ! What a gorgeous boat! What beautiful lines! What comfort! What great fishing and navigational equipment! What a fool I was to sell her! FishWisher at Korth’s Pirate’s Lair on the San Joaquin River, June 2001. C-Dorys are wonderful little boats built with economy in mind. The dory, by definition, is a boat with a narrow, flat bottom, high bow, and flaring sides. The flat bottom is the opposite of a deep V boat. There is little substance to push through the water, so it is an economical boat to power. It has been likened to a “water Jeep” by some owners. They are rugged, built for hard use and very economical. C-Dorys are built in Washington State. The very first one was delivered to Alaska – via water! They are quite common in Alaska due to their cabins and ability to handle pretty rough water. Stern view at Vieira’s dock on the Old Sacramento River. 2003 Pacific galvanized tandem trailer. Screens are (left) Bottomline 6500 FF/GPS/Chartplotter and (right) JRC 1500 Radar Screen. Below are gauges, control panels, Sportpilot autopilot mounted on steering shaft, handsfree cell phone & speaker, windlass controls, etc. From left, smoke/CO detectors, Horizon AM/FM/Tape radio, Horizon loudhailer, Horizon VHF, fuse panel. Spotlight on far right (upper), XM radio above. She really turned heads – especially behind the motorhome! January 2002 and she was reupholstered. The V-berth pad, galley benches and entry to V-berth are now all re-upholstered in sunbrella blue. I suspect that the old fabric was not original, though it was getting worn and in need of a change. Having had her little innards pulled out and made new, FishWisher the boat is quite happy with her new looks. August 2001 drawers were built into the cabin. This was a dramatic improvement, both in appearance and function. Thanks to my friend Chuck for the fine cabinetry work. Such craftsmen are hard to find these days! The tackle tray, fuel tanks and batteries projects completed. I installed the factory’s new custom molded 20 gallon tanks. The new tanks replaced the old 12 gallon metal tanks that were standard when my boat was built in 1987. The tanks are behind the white bulkheads on either side of this photo. The batteries now sit between the tanks, held in place against the tanks and the transom by composite blocks. Thanks to my friend Rich for fabricating that great looking tackle tray. 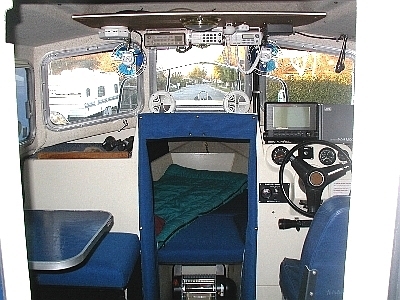 A C-Dory has no deck built above the hull – the hull is the cockpit sole. A dory, by definition, is a small, flat bottomed boat. The photos above show how flat the bottom of a C-Dory actually is. I bought this Bayliner, a very comfortable Delta cruiser, about 1999, some time after selling my houseboat. I had become quite the fishing enthusiast, having caught the bug from my new brother-in-law, Lonnie, after marrying Lavonne. I wanted a comfortable, safe, well equipped boat for Delta fishing with the capacity to overnight comfortably. This Bayliner did it all! She was berthed on a boat lift at my brother-in-law’s dock on Smith Canal in Stockton. I paid him monthly rent for the privilege, but reminded him often that he should have been paying me for making his dock look so good! The flybridge was a wonderful place to enjoy Midlife Cruises, but only in fair weather! The lower station was comfortable and warm during the cold winter days I spent fishing sturgeon on the Delta. And I am reminded that I once had black hair! I spent many a pleasant hour fishing from the cockpit of Midlife Cruises – even during the cold winter nights when sturgeon were moving up the Delta. Before I married my dear Lavonne, back in the 1990s, I owned this very comfortable Carlcraft houseboat. I kept her at a rented slip at the waterfront docks in Stockton, California. I christened her Midlife Cruises. She was 37′ long and I cruised the Delta with her for several years. She was a complete home on the water and I spent many a night aboard. The name won the “Name Your Boat Contest” held by a major boating magazine. It was 1995 when I entered the contest, and by that time I had sold the houseboat and owned the Bayliner (above). Midlife Cruises and I were featured in a color photo in the December 1995 issue of Boating magazine. Sometime later, The Wall Street Journal picked up the story and a reporter called me for details. The story of the name (pretty obvious) and a bit of history about my boating, etc. were then published in that national newspaper. That was my 15 minutes of fame!